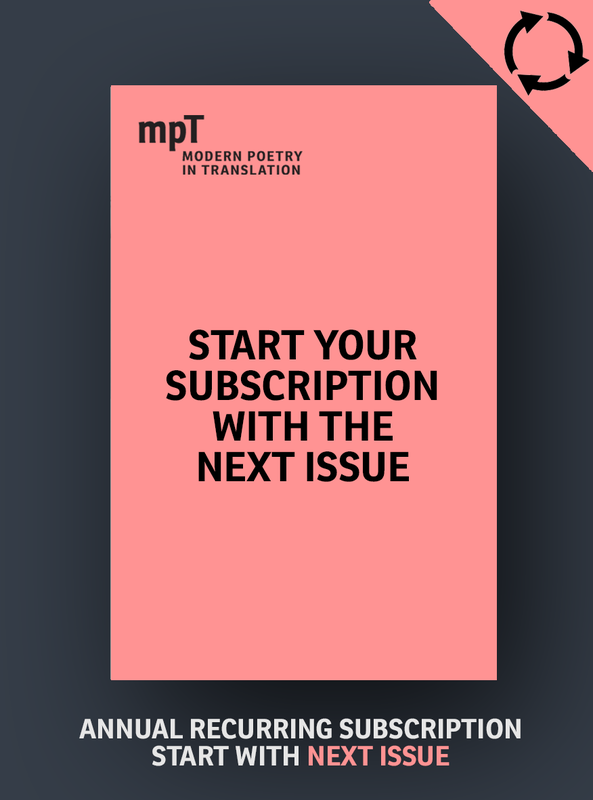 Our policy is to concentrate on a limited number of poets in each issue and to represent each one by a larger sampling of his work than is usually possible in less specialized magazines, rather than to include many poets each with one or two pieces. The type of translations we are seeking can be described as literal, though not literal in a strict or pedantic sense. Though this may seem at first suspect, it is more apposite to define our criteria negatively, as literalness can only be a deliberate tendency, not a dogma. We feel that as soon as devices extraneous to the original are employed for the purposes of recreating its ‘spirit’, the value of the whole enterprise is called into question. Also ‘Imitations’ like Robert Lowell’s, while undeniably beautiful, are the record of the effect of one poet’s imagination on another’s. They may help in the appreciation of the original, they may simply obscure it. In any case, the original becomes strangely irrelevant. Poetry inevitably loses hugely in translation, but those purists who claim that it is precisely ‘the poetry’ which is lost are speaking as though ‘the poetry’ were some separable ingredient, some additive like the whitening agent in a detergent. We feel that enough of the whole is preservable in some, though by no means in all, poetry. Poetry inevitably loses hugely in translation, but those purists who claim that it is precisely ‘the poetry’ which is lost are speaking as though ‘the poetry’ were some separable ingredient, some additive like the whitening agent in a detergent. It will be noted that in our first issue there is a minimum of comment. Indeed there is virtually no comment, simply bare biographical and bibliographical data. This is to some extent the result of our embarrassment at the amount of material we had. As it is we have had to leave out much we should like to have included. We were reluctant to have to leave out still more to make room for critical surveys. Furthermore we are convinced that experience should, in any case, come before judgment, that it is more important to be somewhere than simply to have the illusion that one knows where one is. There has been little attempt to impose any unity on this first issue, but the unity, such as it is, has imposed itself on us. While we had material coming from many other areas of the world, it was that which came from Eastern Europe, which was somehow the most insistent. It is this region which has been at the centre of cataclysm. One of the most remarkable features of the poetry printed in this first issue is its sense of purpose, its confidence in the social as well as private value of poetry, its confidence that it is being heard. This poetry is more universal than ours. It deals in issues, universally comprehensible. It does not fight shy of philosophy. It does not hide behind perverse imagery. As compared with our poetry it comes out into the open. We feel then that this magazine, could it but reach a wider audience than poetry magazines generally do, could not fail to engage that audience. But it is not our aim to disparage English poetry by invidious comparison. We feel, on the contrary, that closer acquaintance with what is being written elsewhere can only stimulate poetry-making in this country. One of the most remarkable features of the poetry printed in this first issue is its sense of purpose, its confidence in the social as well as private value of poetry, its confidence that it is being heard. Thus briefly of our aims and methods. And now our plans for future issues. A Scandinavian issue is at present being planned by a leading young Swedish critic and poet. Invitations have been issued to translators of German poetry and help has been generously offered. We have already collected considerable interesting material from Latin America, a region which could well absorb many issues of our journal. Material for an Israeli issue is also being collected. A fairly comprehensive number on Russia, dealing with not only the younger contemporary poets who have excited such interest lately, but with some of the major figures of the twenties and thirties, as well as of the immediately pre-revolutionary period, is also being prepared. Finally, no reader must take away the impression that there is only one poet of note in each country. In this issue, we have concentrated on the ones we could get most of, and these need not necessarily be the best available. We hope to devote entire issues to each of the countries represented here. This subscription includes three issues a year plus access to our digital archive. You will be charged £23.00, recurring annually. Once your payment is processed, you will receive a confirmation email giving access to the digital archive. Please contact us if you encounter any difficulties with this. Our subscription payments are processed by PayPal or Stripe. You are free to cancel your subscription at any time. You can read our Privacy Notice here. Supported by Pembroke College, Cambridge and The Queen's College, Oxford.